Two San Diego-based destroyers departed Friday for the western Pacific Ocean. The USS Sterett and USS Dewey deployed with embarked helicopter detachments from Helicopter Maritime Squadrons 49 and 78, which are based at Naval Air Station North Island. The vessels will make up a surface action group that will be overseen by the Third Fleet throughout the deployment. Normally, ships fall under the command of other fleets as they sail into their geographic areas. The Third Fleet, for example, generally handles vessels east of the International Date Line. But the Navy tried the new concept last year and considered it a success. “We are building upon the successes and applying the lessons learned from the inaugural Pacific surface action group deployment,” said Capt. David Bretz, commander of Destroyer Squadron 31. 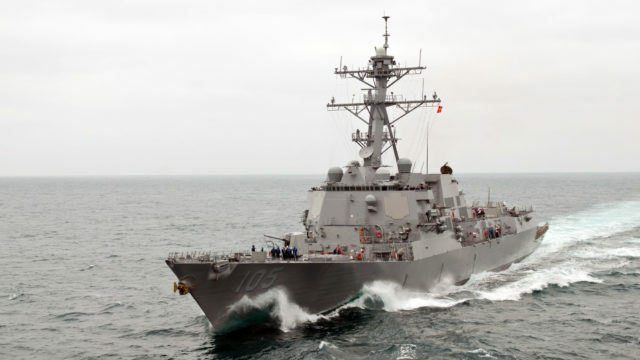 The Sterett-Dewey surface action groups will operate with regional navies to conduct routine patrols, maritime security operations and theater security cooperation activities to enhance regional security and stability, the Navy said. The Sterett and Dewey returned from their most recent deployments in June 2015, when they spent nine months escorting the aircraft carrier USS Carl Vinson. The vessels are named after Andrew Sterett, who commanded the USS Enterprise in a battle off the Barbary Coast in 1801, and George Dewey, who fought in the Spanish-American War and was the only officer to hold the rank of Admiral of the Navy.